The present study was done to assess the pattern of dental caries in 3–6-year-old children. Children with systemic disorders and special children were excluded from the study. Institutional ethical clearance was obtained. Signed written informed consent was obtained from the parents/guardian of the children participating in the study. Data were collected from 3–6-year-old children, who visited the Department of Pediatric and Preventive Dentistry, Vokkaligara Sangha Dental College and Hospital, Bangalore and Indira Gandhi Institute of Child Health, Bangalore. Dmfs in the primary dentition was recorded according to the criteria recommended by the World Health Organization, 2013. All the children were examined under standardized conditions by a single qualified examiner. Caries examination was done using plain mouth mirror, community periodontal index probe, under optimal light source. Each surface was scored independently. Erupted permanent teeth were excluded from this analysis. No radiographic examination was done. 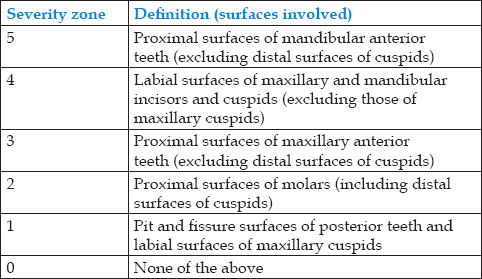 On the basis of the caries recordings, the dmfs score of each child was calculated and each child was assigned to one of the six zones of increasing caries severity, ranging from 0 (caries free) to 5 (most severe) [Table 1]. This hierarchical system works on an assumption of cumulative zone membership, i.e., it assumes that once a child is classified into a given severity zone, it will automatically belong to all zones of lesser severity (excluding severity zone 0). Thus, the zones in the system are mutually exclusive. The present study was done to determine the pattern of dental caries in 3–6-year-old children. Chi-square test was used to compare the study population according to age and gender. Student's t-test was used to compare the data between two groups, i.e., males and females. ANOVA “F” value was used to compare the data between different age groups. Pearson correlation coefficient was used to depict the correlation between dmfs and severity zone score (SZS). The sample size for the study was 500. Out of 500 study individuals, 229 (45.8%) were female and 271 (54.2%) males. 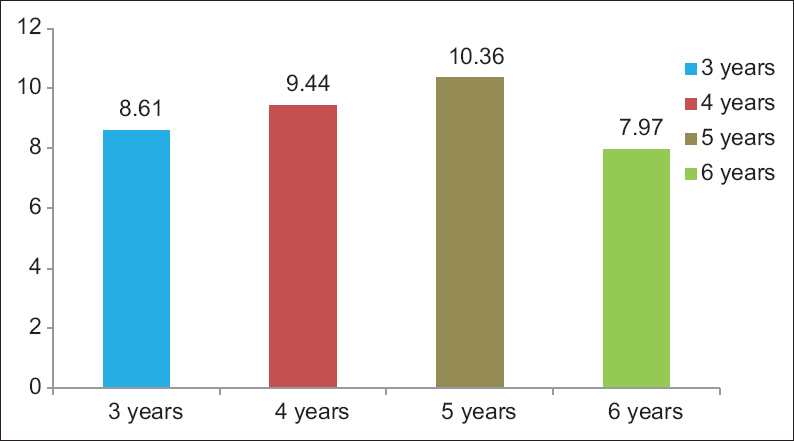 Age distribution of the study population was 3–6 years [Table 2]. The overall mean dmfs for the study population was 9.10. The mean dmfs for the males was found to be 9.88, whereas for females, it was 7.11. There was statistically significant difference in the mean dmfs according to gender (P = 0.009) [Table 3]. When compared among different age group, a considerable caries experience was evident at age 3. The dmfs score increased until age 5 and then stabilized. 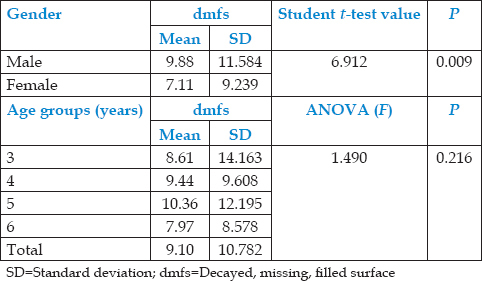 There was no statistically significant difference in the mean dmfs according to age (P = 0.216) [Table 3] and [Figure 1]. Mean decayed component was found to be higher in males (P = 8.53) as compared to that of females (P = 7.11). There was statistically significant difference in the mean decayed component among males and females (P = 0.017). Among age groups 3, 4, 5, and 6, no statistically significant difference was found in the mean d component score (P = 0.214) [Table 4]. On assessment of mean missing and filled component, there was no statistically significant difference in-between males and females (P = 0.276) and between different age groups 3, 4, 5, and 6 (P = 0.224). 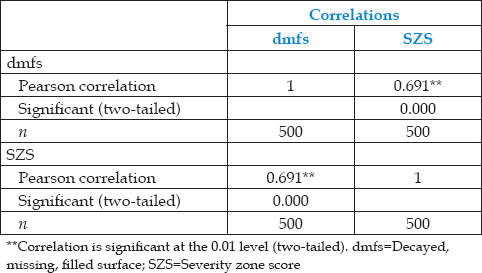 Pearson correlation indicates that there is positive correlation between dmfs and SZS score (0.691) [Table 5]. 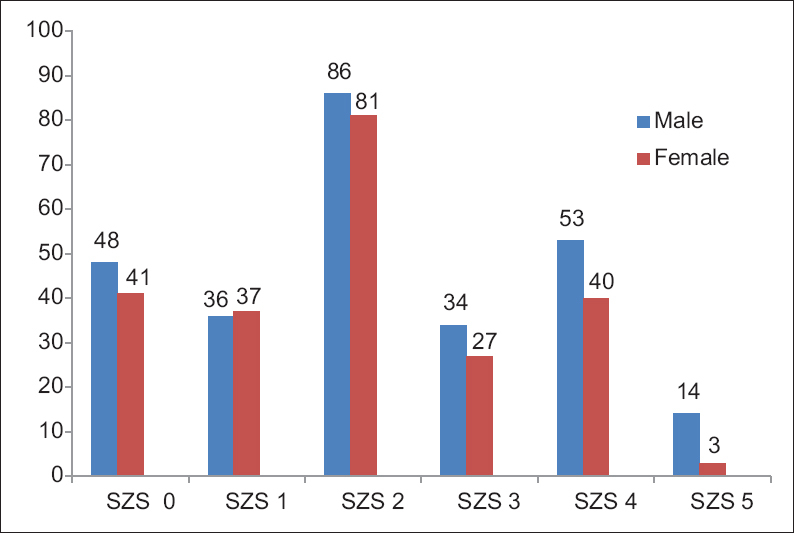 As the dmfs score increases, the SZS score also increases which indicates that there is a strong positive correlation between SZS and dmfs [Figure 2]. Mean dmfs score for those children who were assigned to severity zone 0 was 0.11 rather than 0. This discrepancy was due to the fact that, according to the criteria, the buccal and lingual surfaces of posterior teeth and the lingual surfaces of the anterior teeth were excluded when assigning severity zones. Depiction of the individual SZS score among males and females revealed that out of 500 study individuals, a total of 89 individuals (48 males and 41 females) fell under severity zone 0. Seventy-three individuals (36 males and 37 females) fell under severity zone 1. One hundred and sixty-seven individuals (86 males and 81 females) fell under severity zone 2. Sixty-one individuals (34 males and 27 females) fell under severity zone 3. Ninety-two individuals (53 males and 40 females) fell under severity zone 4 and 18 individuals (14 males and 4 females) fell under severity zone 5 [Figure 3]. The foundation of adult oral health is already laid during the formative preschool years, during which a child's dental caries pattern and caries risk are established. Studies have shown that although the dental decay experience of children, as measured by the dmft index, has improved in most industrialized countries over the past 10 years, improvements in the dmft index of 5-year-old children are no longer seen, and the dental health of this age group may be worsening. The adoption of a caries tool in addition to dmf index to compensate for some of the shortcomings of dmf index could be useful, both in an epidemiological survey purpose as well as clinical examination. Because of its simplicity and added dimension to the dmfs index, Poulsen and Horowitz criteria (1997) could prove to be valuable for use on child population. These criteria were used in a study conducted by Wong et al. to determine the severity and pattern of dental caries in Chinese kindergarten children. The present study explored the pattern of dental caries in 3–6-year-old children and evaluated the usefulness of this hierarchical caries pattern system as an additional caries descriptor along with dmfs. The children included in this study presented with a low level of restorative dental care (only few fillings and/or extractions). This makes them particularly suitable for the study of caries patterns since the distribution of the lesions was not modified by treatment decisions of the dentist. The overall mean dmfs for the study population was 9.10. Although an average dmfs value of 9.10 for the study population indicates a serious oral health problem, the dmfs itself does not in fact help us to understand the nature of the caries process. The distribution of children according to the severity zones of Poulsen and Horowitz indicates a very low percentage (17.8%) of caries-free children and also a high percentage of children with caries in severity zone 2 (33.4%) which makes proximal surfaces of posterior teeth (including distal surfaces of cuspids) and severity zone 4 (18.6%) which makes labial surfaces of maxillary and mandibular anterior teeth (except those of maxillary cuspids). Thus, a valuable addition to the dmfs information is achieved which points both to a possible etiologic factor and to possible preventive measures that could be undertaken. It was observed that mean dmfs score for those children who were assigned to severity zone 0 was 0.11 rather than 0. This finding was consistent with previous study done by Wong et al., in which the mean dmfs score for the children assigned to severity zone 0 was 0.3 rather than 0. This discrepancy was due to the fact that, according to the criteria, the buccal and lingual surfaces of posterior teeth and the lingual surfaces of the anterior teeth were excluded when assigning severity zones. However, while recording dmfs, caries was naturally counted on all the surfaces of the teeth. It was observed in the present study that there is positive correlation between dmfs and SZS. As the dmfs score increases, the SZS also increases. This was consistent with the study conducted by Wong et al., wherein a strong positive correlation was found between dmfs and the SZS. Out of 500 children examined, occlusal surface of posterior teeth was affected in 74.1% children, and in 56.6% of children, proximal as well as occlusal surfaces of the posterior teeth were affected. Proximal surface of maxillary anterior teeth was affected in 31.6% of children. In the present study, anterior teeth were less often affected by caries as compared to the posterior teeth, and the lowest prevalence of dental caries was observed in the mandibular anterior teeth. This was in accordance to a study conducted by Gizani et al. in which the posterior teeth were most prone to caries attack and the least being mandibular anterior teeth. In their study, buccal and lingual surfaces of all the teeth were examined for the presence of carious lesion. Whereas, the present study failed to examine the buccal and lingual surfaces of the posterior teeth and the lingual surfaces of the maxillary and the mandibular teeth while assigning the severity zone. As it is observed that these surfaces are also often affected by caries, important information is being missed by not examining those surfaces. The hierarchical severity zone system as originally proposed must be subjected to minor modifications to improve the fulfillment of basic assumptions underlying the method. The Poulsen and Horowitz model gives broader aspect for the assessment of severity of dental caries in 3–6-year-old children. By routinely using dmfs and hierarchical system together, a more complete picture of the caries status of the population could be provided. It could also help differentiate between different caries patterns that could suggest different etiologies and consequently different preventive approaches, which would ultimately help in preventing the progression of the disease process. Psoter WJ, Zhang H, Pendrys DG, Morse DE, Mayne ST. 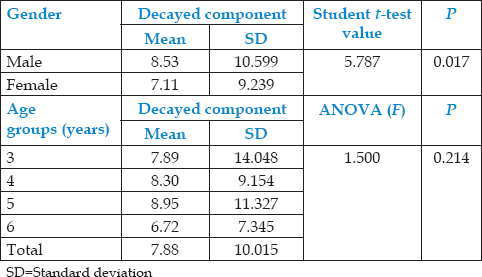 Classification of dental caries patterns in the primary dentition: A multidimensional scaling analysis. Community Dent Oral Epidemiol 2003;31:231-8. Ferro R, Besostri A, Olivieri A. Caries prevalence and tooth surface distribution in a group of 5-year-old Italian children. Eur Arch Paediatr Dent 2009;10:33-7. Gizani S, Vinckier F, Declerck D. Caries pattern and oral health habits in 2- to 6-year-old children exhibiting differing levels of caries. Clin Oral Investig 1999;3:35-40. Wong MC, Schwarz E, Lo EC. Patterns of dental caries severity in Chinese kindergarten children. Community Dent Oral Epidemiol 1997;25:343-7. Poulsen S, Horowitz HS. An evaluation of a hierarchical method of describing the pattern of dental caries attack. Community Dent Oral Epidemiol 1974;2:7-11. Johnsen DC, Schultz DW, Schubot DB, Easley MW. Caries patterns in head start children in a fluoridated community. J Public Health Dent 1984;44:61-6. Douglass JM, Yi W, Xue ZB, Tinanoff N. Dental caries in preschool Beijing and Connecticut children as described by a new caries analysis system. Community Dent Oral Epidemiol 1994;22:94-9. Johnsen DC, Schechner TG, Gerstenmaier JH. Proportional changes in caries patterns from early to late primary dentition. J Public Health Dent 1987;47:5-9. Ismail AI, Sohn W. A systematic review of clinical diagnostic criteria of early childhood caries. J Public Health Dent 1999;59:171-91. Mattila ML, Rautava P, Sillanpää M, Paunio P. Caries in five-year-old children and associations with family-related factors. J Dent Res 2000;79:875-81.